Chemicals used to treat drinking water for millions of Americans may raise the risk of cancer and lead to other unintended health hazards, according to a report released this week (Feb. 27) by the Environmental Working Group, an advocacy organization. The group is urging the U.S. Environmental Protection Agency to reevaluate its standards for the byproducts created when water is disinfected. The Environmental Working Group also is pushing officials to clean up sources of public drinking water to reduce the need for chemical treatment in the first place. “By failing to protect source water, Congress, EPA and polluters leave Americans with no choice but to treat it with chemical disinfectants and then consume the residual chemicals generated by the treatment process,” the report says. 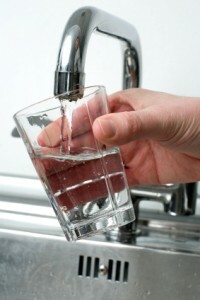 Chlorine and other chemicals are added to public drinking water to kill disease-causing bacteria and other microorganisms. But when they come into contact with organic material such as fallen leaves, sewage or livestock manure, reactions occur that create toxic byproducts. Some of the resulting compounds are regulated, but most are not. “We’re talking about 600 known disinfection byproducts and probably many hundreds more that haven’t been identified,” said Renee Sharp, a senior scientist at the Environmental Working Group and a co-author of the report. The report argued that the EPA’s limits are too lax, citing several studies linking even lower levels of the chemicals to health problems. For example, in 2011 a French research team analyzing data from three countries found that men exposed to more than 50 parts per billion of trihalomethanes [try-hal-o-MEH-thanes] had significantly increased cancer risks. In 2007, Taiwanese researchers found people who drank water with trihalomethane concentrations of more than 21 parts per billion had twice the odds of dying from bladder cancer than those who did not. In 2010, California environmental health regulators proposed a public health goal for trihalomethanes of 0.8 parts per billion — one-hundredth of the federal standard. The goal, which would not be legally binding, is in the process of being finalized. But David Savitz, a professor of community health at Brown University who has studied the issue, says the chemical byproducts created by disinfection are only of “modest concern.” He faulted the report’s authors for selectively focusing on studies that suggested evidence of harm while ignoring ones that did not. “The general tone of this report is alarmist and exaggerated,” he said. In response, Sharp said both the EPA and California health officials have concluded that lowering the levels of trihalomethanes in drinking water would cut the number of bladder cancer cases. “We are not the only ones saying this,” she said. The Environmental Working Group is a nonprofit research and advocacy organization based in Washington, D.C., that is focused on public health and the environment. 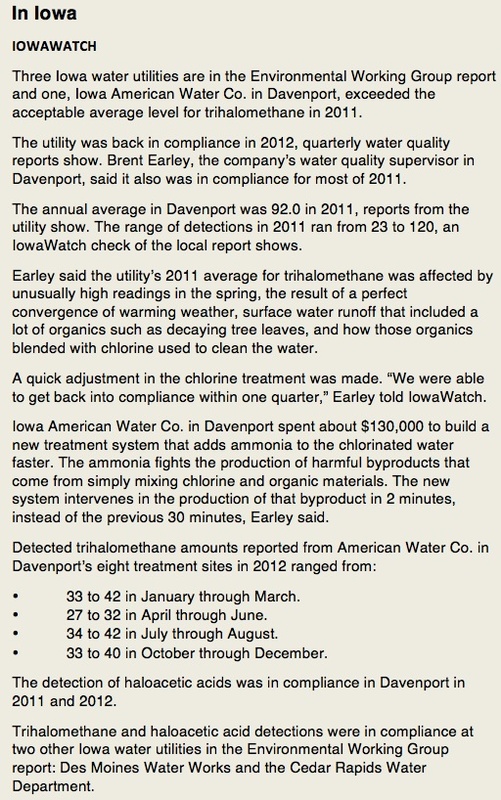 The EPA, which previously has considered lowering the limit for trihalomethanes, declined to comment on the new report. In 2005, it proposed a rule that would have lowered the limit to 40 parts per billion, a move that it calculated would prevent nearly 1,300 cases of bladder cancer and save the U.S. between $2.9 and $7.1 billion annually. Instead of adopting the rule, however, the agency made what the report called “marginal” improvements in its system for measuring compliance with existing regulations. The EPA said these changes will prevent 280 cases of bladder cancer annually. 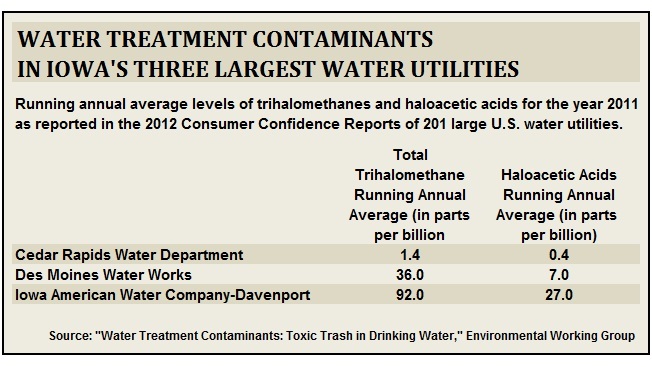 Analysts also found that levels of trihalomethanes in public water systems vary throughout the year, depending on factors including farming cycles. The EPA, however, regulates the chemicals based on an annual average, which means that spikes in the byproducts may go undetected. Health concerns have prompted some public water systems to switch from chlorine to chloramines, compounds made from chlorine and ammonia gases. This substitution, however, may usher in other problems. For example, Environmental Working Group researchers cited EPA data reporting that drinking water treated with chloramines had the highest levels of an unregulated and potentially highly toxic class of chemicals called idoacids. Chloramine also forms nitrosamine compounds, which are related to chemicals “reasonably anticipated” to be human carcinogens, according to the federal National Toxicology Program. Where are Davenport’s THM levels now?